Every Wednesday the email from Money Saving Experts arrives in the inbox, sometimes I open it to have a look, often I don't bother. 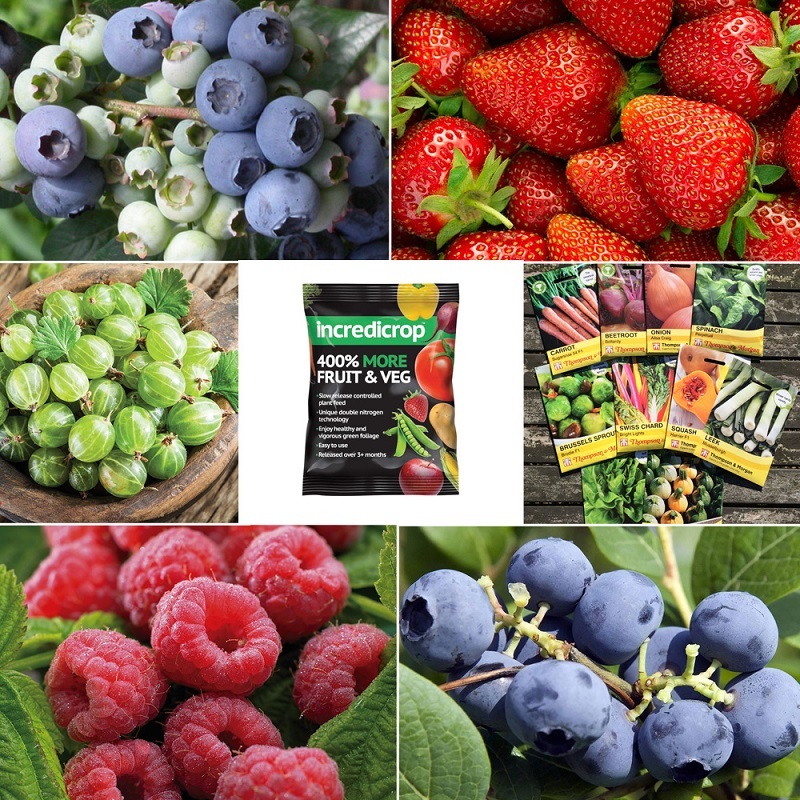 If you go via this MSE Blagged Thompson and Morgan link you can get a bundle of 23 berry plants plus some vegetable seeds for £17.94 delivered (normally £56.95). You'll also get 200g of Incredicrop fertiliser. The offer ends at 11.59pm on Sun 3 Feb, or when 4,000 plant bundles have gone, which ever is sooner – so go quick if it’s something you want. Now this IS a bargain that appealed. The raspberry canes will replace some that didn't survive last summers dry weather. The strawberry runners can be potted and kept in the cold frame for an early crop. If the seeds are ones I won't use they will go in the car-boot box. There's room for the gooseberry bushes in the middle of the fruit bed and the blueberries will be a real treat as it's many years since I owned a blueberry bush. I now need to stay here for at least 2 more summers to get the benefit of this bargain buy! Hopefully they will arrive in good condition very soon and I can get them potted up. Just need some ericaseous compost for the blueberries. Wow, that WAS a bargain! (I didn't read the email this week...mind you, we have enough fruit anyway). MSE e mails are always worth reading. I didn't get this deal but I've had many others from there. Now wondering what I've missed! That’s worth getting if you have the room Sue. That is the one thing I really miss about our old house. We had a large fruitgarden by the kitchen with all the soft fruit we could possibly want; almost too much. Now we have a few raspberry canes, a clump of rhubarb and some strawberry plants. That was a very goof buy especially you have got the room. I always have a quick look on his post but I don't look at his TV program. Had to be up early today the water man is coming to put a new meter in. Wow, that is a bargain! Great bargain. I don't always read the emails. A great bargain - excellent value and I love that if you get them, you are making a commitment too. I'm afraid I didn't read the email either! Blueberries are sacrilege in this country when we have our own beautiful blackcurrants bursting with flavour, of which a blueberry has none. Permission to have both please! Granted by me - especially if you grow your own. Absolutely. Gardening is about growing a varitey of things. I think sacrilege is a bit strong? The blueberries from this offer will add to the three plants I already have, which will burst with flavour when harvested. And get a sense of humour Houghton. I got this offer, too. A bargain I couldn't resist. I love blueberries and so do my boys in a yummy breakfast cake I bake. We never ever get bargains like that one. Very envious. I grow both blackcurrants and blueberries. In my opinion blueberries are more versatile although blackcurrant jam is hands down my favourite jam. Almost made me wish I had a vegetable garden again. I haven't had much luck growing fruit at all - maybe it's time to try again! I did plant 2 raspberry canes last year that didn't amount to much by the end of the season. Maybe they'll come back this year. I also ordered these, had an email to say the despatch date has been moved by four weeks. Not a problem, hope I will be ready for them by then. I got that notification, too, Gill which, considering the weather is no problem for us, so with a good sense of humour I had a giggle about that. What a great offer, such a shame I have missed it.